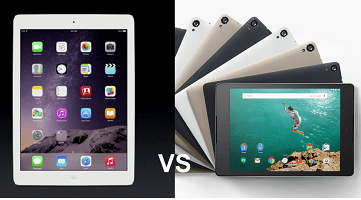 Google Nexus 9 VS iPad Air 2: Which One is Suitable for You? As is known to all, co-developed by Google and HTC, Google Nexus 9 is the fourth tablet in Google Nexus series and offers two storage sizes, 16 GB and 32 GB. It was announced on October 15, 2014. It is breathtaking for Nexus fans that pre-orders are available on October 17, 2014 in the United States. It is well-known that iPad Air 2 is the sixth-generation iPad tablet computer designed, developed and marketed by Apple Inc. It was announced on October 16, 2014 as well as the iPad Mini 3. Beyond all question, it must be thinner and faster than its predecessor iPad Air. On account of similar release date, inevitably, Google Nexus 9 vs iPad Air 2 becomes a controversial issue for the handheld device enthusiasts. They are urgent to know which one is better or worthy of buying. Of course, their objective comparison made among price, display, battery, etc. will be widely adopted by potential purchaser of Nexus 9 or iPad Air 2. However, even for a bystander, he also wants to know the final winner on this fierce tablet fight between iOS and Android. To meet the public requirements, the comprehensive comparison is listed as below. Android 5.0 and iOS both are the latest operating system developed respectively by Google and Apple. Nexus 9 runs Android 5.0 and iPad Air 2 runs iOS 8. These are two most popular and best mobile operating systems so far. It can't say which one is better because of different apps, user interfaces and other features. But, there is an answer already in your mind about which one is right for you based on your former experiences. Certainly, OS has become the primary factor to make decision on buying Nexus 9 or iPad Air 2. Meanwhile, there is no lack of people who are eager to try different OS that is encouraged. Although Nexus 9 is lighter than iPad Air 2, the new iPad is just 6.1mm thick. It is right that both of them have the same 4:3 aspect ratio display and pixel count. The iPad Air 2 features a new anti-reflective coating on its screen so that it is easier to use outdoors. The research shows that quality materials are used on these two tablets, which can explain why Nexus 9 is more expensive than its predecessors. Both Nexus 9 and iPad Air 2 have two cameras: on the rear and on the front. For Nexus 9, the rear-facing camera is 8MP with flash HD (1080p) resolution and there is a 1.6MP camera on the front. As for iPad Air 2, it owns 8Mp rear-facing snapper with geo-tagging, touch focus, face/smile detection and HDR; the front camera is 1.2MP. According to official announcement, 16 GB Nexus 9 is US$399 and 32 GB is US$479; 16 GB Wi-Fi iPad Air 2 is $499, 64 GB is $599 and 128 GB is $699. It appears that the Nexus 9 has no MicroSD expansion option. Without doubt, if you have enough money and are a biggest fan of Apple, choosing iPad Air 2 is wise. Video formats: H.264 video up to 1080p, 60 frames per second, High Profile level 4.2 with AAC-LC audio up to 160 Kbps, 48kHz, stereo audio in .m4v, .mp4, and .mov file formats; MPEG-4 video up to 2.5 Mbps, 640 by 480 pixels, 30 frames per second, Simple Profile with AAC-LC audio up to 160 Kbps per channel, 48kHz, stereo audio in .m4v, .mp4, and .mov file formats; Motion JPEG (M-JPEG) up to 35 Mbps, 1280 by 720 pixels, 30 frames per second, audio in ulaw, PCM stereo audio in .avi file format. Audio formats: AAC (8 to 320 Kbps), Protected AAC (from iTunes Store), HE-AAC, MP3 (8 to 320 Kbps), MP3 VBR, Audible (formats 2, 3, 4, Audible Enhanced Audio, AAX, and AAX+), Apple Lossless, AIFF, and WAV. Supported video formats of portable devices are one of the most important elements when choosing tablet. This is why we list it separately as well as make you know whether it can play videos from your movie collections or not. Notably, some of Nexus 9 and iPad Air 2 supported video/audio formats belong to the common video formats the same as other devices. But, unfortunately, they will fail when face DVD movies and other unsupported movie formats, such as MKV, AVI and more. On this occasion, MacX DVD Ripper Pro can offer you the best solution to transfer DVD to these two new devices and MacX Video Converter Pro also provides you the ultimate way to convert any videos to them for playback without any limitation. It seems like both of them are evenly matched. If you really want to get a certain answer between them, you'd better ask help from your pocket: how much do you plan to spend on purchasing?